This function within the settings area together with SMS are the most beneficial time savers. 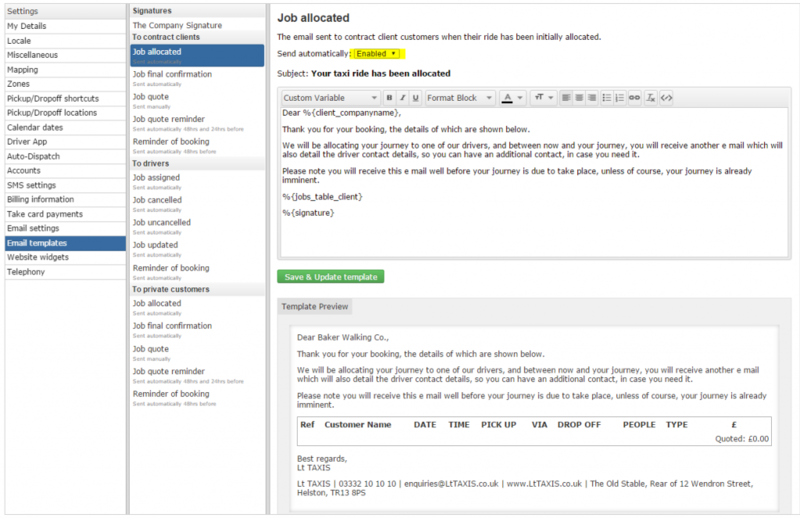 The ‘Email templates’ tab provides the functionality for your company to set up your own automated e-mails. These are set up as automatic functions which vastly increase administrative efficiency. Taxi Hub is currently setup with a number of generic e-mails which all work effectively & pull the correct information from the system. All you need to do is alter the wording if you wish & add your own personal company signature. The information that pulls the correct tables from the system is denoted by the HTML coding areas which show the % symbol before them. When personalising the e-mails for your company change anything, apart from the coded areas which follow the % signs. It is also possible to disable any of the e-mails that are set up if you wish.